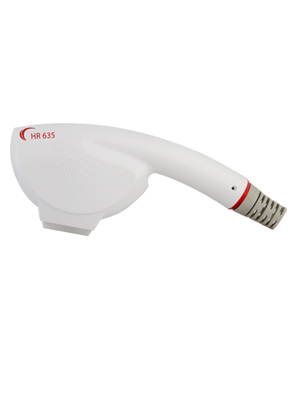 This handpiece is designed for hair removal treatments for I-V skin types, and emits a 635– 950nm red wavelength. The handpiece delivers three levels of pulses- DPC smooth, long or high. It has a spot size of 6.4 cm2 and a fluency that ranges from 5-25 J/ cm2. Once you select the skin type, hair color and hair type, the handpiece’s software automatically sets the optimal treatment parameters. However, you can also select the parameters manually. To protect the epidermis throughout the treatment, the handpiece has a Sapphire contact cooling with two modes- high and low. The DPC HR 635 has been ergonomically designed for ease of use for prolonged periods of time. Copyright ©2018 SharpLight Technologies Inc.